Worldly Connektions inspires listeners to LIVE LIFE and BE HAPPY through the power of conversation and positive energy from Janet and other experts who believe that Life is a team sport and when we all work together miracles happen. Janet Wiszowaty -Visionary Coach & Consultant – is on a mission to empower people to keep moving forward, have a vision and trust that something good will come of it. Our special guest host is Deeanne Riendeau. 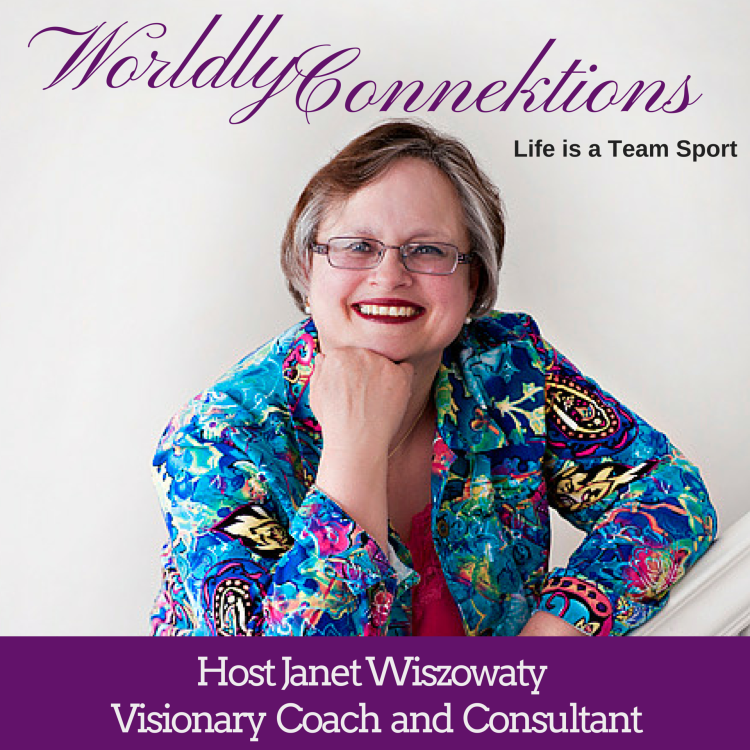 Join Janet Wiszowaty – Visionary Coach – for her premiere episode of Worldly Connektions! During this 30 minute show, Janet share her own personal journey of how she brought Magic into her Life through the power of conversation and positive energy; and why she believes that Life is a team sport and when we all work together miracles happen. Gratitude - What are you thankful for? Special Guest Daphne McDonagh is grateful to her parents for not allowing doctors to harvest her organs after a near fatal car accident that left her with a closed brain injury, while in a coma on life support. They were told if she survived she would be a vegetable...in Daphne's words "I look pretty good for a carrot" When Daphne was 15 she suffered a massive brain injury. She had been living in pain for almost 20 years when she discovered the amazing healing properties of magnets and crystals. I met Maggie in 2011 when we were both studying with Marcia Wieder, the Founder of Dream University. Maggie had just started her "WOW" - Women of Wonder group for women and making a difference in her community. Today she is shining her Star far and wide and helping others Catch Their Star! Maggie Schreiber captivates audiences with her vibrant, approachable style. She is able to connect with the audience at a heart level as she inspires dreams, and transforms lives. Her passionate and creative talks engages the audience as she delivers insightful and compassionate solutions to overbooked schedules, business challenges, life transitions and forgotten dreams, acting as a catalyst to creating a life of abundance, harmony and joy. Recognized as an expert in building women's community, Maggie is the founder of Women Of Wonder a spiritually based group of self-discovery. She nurtures women to know they matter and their dreams goals and desires, matter. Maggie shares the power of a women's group in her book "Catch Your Star" which she is a co-author along with many other amazing women. Nathan Ohren is the Founder and Creator of Write4Life; he is also the host of the Journal Talk Podcast where he interviews people from all walks of life about their journaling. He recently interviewed Jack Canfield the co-author of Chicken Soup for Your Soul and the author of The Success Principles about how Jack uses journaling in his life. Today, Nathan will be sharing his wealth of knowledge with us and talk about some of the programs he has created. Listen and prepare to be inspired. Sheri Fink is so much more than her bio, this young woman has inspired confidence in children and adults alike with her books and presentations. Then she goes even further and mentors children to write their own books, first an eleven year old girl and more recently a 13 year old boy. Sheri Fink is an inspirational speaker, a #1 best-selling author, an award-winning entrepreneur, and the founder of “The Whimsical World of Sheri Fink” brand. All five of her children’s books were #1 bestsellers. Sheri’s newest adventure is a contemporary romance. She was inspired to write Cake in Bed, her debut novel, to empower women to be their authentic selves and to not settle for less than they deserve in life or in love, because everyone deserves to have their cake and eat it too … preferably in bed! I first met Janet Larson in the fall of 2010 when we both attended a Jack Canfield training workshop in San Diego. Janet shared with me that she was working on a book called My Diary Unlocked and it is now out there in the world and I am honoured to have her as my guest on Worldly Connektions on tlrstation.com. Janet Larson wrote and shaped this insightful book of awareness a decade and a half after graduating high school, Janet found and read the red diary she had kept during her senior year. She sat and read the entries in their entirety which revealed a terrified young woman growing up in a home darkened by alcoholism and struggling with feelings of inadequacy and self-doubt. She created My Diary Unlocked to help every girl and every women to know they are not alone. The result is "My Diary Unlocked: Stories of Teen Girls Heal the Inner Adolescent of Our Soul," which scored a silver medal at the Independent Book Publishers Association's annual awards in the category of self-help. Today my guest on Worldly Connektions is Yeliv Adams a Franchise Matchmaker! I first met Yeliv when we were taking a Jack Canfield training in San Diego in 2010. Her beautiful smile and her passion to help others kept us friends. We spoke about her South American background and trips to Machu Pichu... we all wanted to go. Today she helps immigrants and people in the United States to build a business with a franchise. She is a Franchise Match Maker! Using the tools she has learned from experience and training with Masters such as Jack Canfield and Tony Robbins she works with people to find what their dreams/desires/finances and passions are to match them with a franchise that will fit their needs. She worked as a Franchise Development Consultant for a top 50 Franchise spearheading the sales team for their emerging brand targeting the Hispanic market in the U.S.A. She has a wealth of knowledge and has put it to use in the business she has founded, Franchise Connectors LLC. If you have been considering a franchise, set up a call with Yeliv, it will save a time, energy and possibly disappointment. Lynnea Hagen shares with us how inspiration is different from motivation, and what is its impact? She is a wealth of knowledge and her motto for her business, and her life, is: “Life’s too short to do it half-way!”, and she brings that passion into everything she does. Lynnea is a speaker, trainer, author, consultant, and the owner of The Abundance Company, specializing in advanced leadership skills and “success-driven” strategic business plans for entrepreneurs and corporate professionals. She has been a consultant to Silicon Valley-based corporations since 1981, and a coach to corporate professionals since 1986. I met Sally Armstrong when she was the speaker at the Enbridge Famous 5 Speaker Series. I have to be honest, I did not know who she was but her message and her stories had me wanting to know more about this great, fellow Canadian, woman. In this interview, she gives you a glimpse of who Sally Armstrong was before she became a multi award winning international journalist and the passion she has for Women and Girls in war torn, conflict countries and an advocate for them at home. Learn more about Sally on YouTube: http://youtu.be/_KDiiB3JSgo and through her books available on Amazon. Sally Armstrong is an award winning author, journalist and human rights activist she’s a three-time winner of the Amnesty International Canada media award. I had the pleasure of getting to know Allen Kanerva when we attended a Master NLP, Time Line Therapy and Hypnotherapy training in 2015. Allen is passionate about helping people move forward and heal the wounds in their life that keep them from being the person they were meant to be. Allen has a military background and is all too aware of how PTSD (Post Traumatic Stress Disorder) can restrict a person's life. He is a forever learner always seeking more knowledge to help his clients and has a protocol he uses to take his clients, with PTSD, through to recovery. I came across Dr. Kelly Flanagan when I read a blogpost of his that went viral, http://drkellyflanagan.com/2013/04/17/a-daddys-letter-to-his-little-girl-about-her-future-husband/. I was impressed with the post and like other posts he had written. I am grateful to now have him as a guest on Worldly Connektions. I met Joyce Buford in 2010 when we both were at Jack Canfield's Breakthrough to Success in Scottsdale, Arizona. We have been on many trainings together both with Jack and Marcia Wieder and I love how Joyce is helping so many with her programs and her show Second Wind. Joyce Buford is the creator of the Uncover Your Hidden Genius program that guides her clients to realize their greatest potential. She is a speaker, trainer, coach, and author. Joyce is the host of Secondwind on Toginet Radio and Guest Columnist for the Tyler Morning Telegraph. Her contribution to the ground work in building this start up museum provided Tyler, Texas with a children’s science museum will respected by the museum world. She is a Member of the Texas Leadership Program and Leadership America Program. Jean Leggett shares with us what One More Story Games is and how it works. If you like to read and like to play video games OMSG's takes it to a whole new level. Jean Leggett is the chief Operating Officer of One More Story Games. When I met Jean, at a conference we were both attending, she was a comedian, coach and speaker. She is still all of them and much more. Jean has added her English degree to helping authors navigate the world of interactive storytelling with OMGS's StoryStylus. She is a fellow Canadian who is based out of Barrie Ontario. Today's guest, Steve Critchley is a 28 year veteran of the Canadian Forces and an international mediator, facilitator, negotiator, and trainer. During the Bosnian war, Steve Critchley witnessed human conflict at its worst. His experiences included negotiating with armed belligerents and establishing local areas of trust and co-operation. In 1999, Steve was included in a select group from DND to undergo Mediation training coordinated by the Executive Director for Conflict Management responsible to the Federal Government. Steve has provided services for Canadian and U.S. governments as well as training programs in South Africa, Ghana, Milan, London, and Dubai. Today I am speaking with Lorraine AKA "Rain" Gabriel. We spoke in depth on "being perfect, not wanting to look stupid." What do all those dynamics look like, how and where it stops us..... "How to screw up and change It." I'm excited to share my dear friend and accountability buddy with you. Lorraine and I met when we both took Jack Canfield's Train The Trainer program for The Success Principles. She has been my rock on many occasions and I have loved watching her grow and expand her wisdom. In today's episode, Janet is talking with DeeAnne Riendeau, founder of Your Holistic Earth; which is the first Holistic Health Care system in Canada which removes the barriers for the public and providers by making alternative health more affordable and more accessible. What is your formula for living a life you dream of want and love? Why is it important for people to go after what they are "called" to do? DeeAnne Riendeau underwent a Near Death Experience at age 5 and lived with illness for much of her child and teen years which led her to a 15 year career in health care. She has worked in various capacities as an EMT, a Dental Assistant, and as a health care instructor in colleges throughout Alberta. Tamena Powers is a women on purpose! From the age of 10 she was s successful entrepreneur with her day timer full of babysitting jobs. At 19 she was the owner of her own hair salon. She just keeps expanding and is definitely a person you want to work with. Check out her businesses, she is the co owner of 3 buisinesses, one including one with her mother and daughter - Powers & Co - www.powersandco.co/ , Acacia Institute -acaciainstitute.com and Pagett smallbizpros.ca. In this interview Tamena shares about the businesses and the Power of 3 generations working together and about their upcoming book. In today's episode, DeeAnne Riendeau is stepping in as host for Janet Wiszowaty as Janet is up in Nunavut (Canada's 3rd Territory). Our guest today is Angela Sladen De Rox. She is joining DeeAnne to speak about her story and passion for leadership. Angela talks about leading by example and provides some great advice to other women who may be just starting out or making change. Angela is the Managing Director for Edmonton and Calgary chapters of the Womans Global Leadership Alliance(WGLA). She let's us know about about WGLA and their mission to empower women. Visit www.totalhealthmethod.com to find out more about Angela and womensgla.com for how to get involved with the WGLA. Debra Kasowski is passionate about helping people who are afraid to ask for what they want and helping them learn how to ask the right questions. She will share with us how a person can put together their questions and how being curious can help us make better decisions. Tamara Rasheed broke free from a life poverty to become a successful business woman while raising her 5 children. She took what she learned on her journey of leaving an abusive relationship, becoming a single mother and being on welfare and in debt to overcome it and wants other women in the same situation to do it as well. Dr. Sergio William Sedas is a Best Selling author and international high-human-potential trainer. He uses intentional possibility to cause positive transformation in life, communities, and organizations. His newest book is Intentional Possibility: The Magic of Happiness and the Power of Change. He is one of the nicest caring person/educator I know. For over twenty years, Sergio has studied and engaged in possibility and cognitive science to create engagement, intrinsic motivation, creativity, learning, increased self-confidence, and resiliency in students, adults, and organizations. His work in learning through understanding and possibility influenced the design of a national program to develop self-confidence, resilience, and passion in first-year undergraduate students. He has been a keynote speaker and trainer for corporations, governments, TEDx, universities, and nonprofit organizations seeking to use the power of possibility. Funded by NASA, U.S. Air Force, National Science Foundation, and CONACYT, Dr. Sedas received two Master's degrees and a PhD in robotics and computational design from Carnegie Mellon University. There he worked on numerous initiatives including ASE (Automated Simultaneous Engineering) and DANTE, the first robot in history to enter a live volcano in Antarctica. I'm Still Alive, Now What? Surviving and thriving after a life-changing event.When I first connected with Donna via our connection to Jack Canfield I found we had more than Jack in common. Donna Kater is an author and online video course instructor. She is known as a master in reinventing oneself and is dedicated to helping others, particularly after they've gone through something really big, such as a divorce, major illness, or death of a loved one. She hosts an online course called: “I’m Still Alive, Now What? How to Survive and Thrive After a Life-Changing Event” and has written a book with the same title. She shares practical tools about how to heal your past so that you can move toward a brighter future. Her book "I'm Still Alive, Now What?" Can be found on Amazon. "When I first read Twyla Doyle's goal about saving the bees that she found on their property I wanted to meet this young woman. Twyla is a young professional woman who has used her passion to learn about bees and create her first bee hive in under 6 months. She shares the journey with our Worldly Connektions audience. This 25 year old nurse has changed how I look at bees." Janet met Christina A Caeliss in Italy 6 years ago! This lovely Irish Woman is known as The Magic Making Maven - "mmm" and Lucky Charm for Love and Your Dreams. On this episode of Worldly Connektions, Christina share her Powerful Aphrodite Manifesto and the Story Streaming Method she had developed for her clients. Douglas Morrison's first novel, Course Correction, kept me reading into the wee hours of the morning and now I get to share him with you. You never know what can happen when you pick up a book at one of the free libraries in your neighborhood, I ended up meeting Douglas 3 days later when he did a book signing at Audey's Book Store in Edmonton. Douglas is a former Commercial Pilot, volunteer in Ukraine and a has a great sense of adventure that showed up in his book...it left me wanting more. There are so many people out there who have influenced wonderful changes in my life and my guest today, Caterina Rando is certainly at the top of the list. I first met Caterina when she was speaking on stage at a workshop I was attending in San Francisco, California. At that workshop I put my name on the list to be considered as an author an upcoming book Caterina was doing to help women entrepreneurs develop a product. Long story short, she "personally" called me and asked me to do a chapter in the book Power to Change. The chapter she asked me to write was about journaling. If you go to my website www.familyconnekt.com you can download that chapter, my gift to you. Listen to our conversation as Caterina shares her love of giving and what she is doing about it as well as some of her programs, the power of community -on and off line. Little did I know when I met Carrie-Ann Baron in the summer of 2015 that my life would be forever changed. At that event where Carrie-Ann was the guest speaker we sat and talked for what felt like hours at the close of her presentation. Today, because of our mutual friend DeeAnne Riendeau, I am now one of her radio show hosts on tlrstation.com. We are an adventurous pair and in this episode we talk about Carrie-Ann's journey to becoming an internet radio station owner, coach, author and I am sure I missed something. She has become my valued friend, coach, sounding board and the person who will meet me in strange places. Listen in as we share our unique entrepreneurial life. If you have been following the show, you know that my husband was transferred to different cities, towns and provinces. I love my adventurous life but sometimes when an injury has occurred it is challenging to find the health support you need to recover from that injury. Thankfully, when we moved to Alberta, I was introduced to Marla Yaworski a Massage Therapist that was so passionate about helping her clients get better she was forever researching and upgrading her skills. Today she will share with us one of those treatments, Manual Lymph Drainage. She acquired specialized training in Manual Lymph Drainage and Combined Decongestive Therapy, which focuses on cancer survivors that have developed lymphedema or those suffering with ulcers. I learn something new everyday and this is one treatment that could provide relief to someone with lymphedema. Thrivalist, Author, and Inspirational Speaker DEBORAH KINISKY should have been a statistic of abuse and addiction, but instead rose above adversity. Her first book, HerStory- Victim to Victorious, is a memoir and raw depiction of abuses and triumphs she has thrived above and is the backbone to the story of her life. Released on August 9, 2016 Purple sky Survivalist – Growing up a victim of Illusions is her SECOND book but her first in the Survivalist to Thrivalist Series and is the meat and potatoes of her life and reflects the heart of her story rather than the hurt. Through writing, photography, and inspirational messaging and speaking Deborah supports others on their own journey of healing and self-awareness. Deborah is grateful to call Edmonton, Alberta home where she lives with her loving husband, youngest son, and 2 four-legged doghters, while her eldest son loves her from afar in the U.K.
MC is an Emotionologist. Her mission is to demystify emotions so that we can make them work FOR us instead of AGAINST us. Also a former dietitian and ardent believer in health being our greatest wealth, MC currently works with women who wish to lose weight by leveraging the power of emotional intelligence. MC feels she has come full circle by combining her knowledge of Dietetics and Behavioural Change since, in addition to her Dietetics degree, she holds a Graduate Certificate in Executive Coaching from Royal Roads University. Today, MC is here to help us better understand emotions and how emotional eating is the best way to a healthier and lighter body. Today I am happy to share with you Laura Menze who is the Chief Love Officer at Ready-Match which offers a unique and authentic approach to dating and matchmaking for singles. Join us while we talk about her relationship building services, her up and coming TV Show Project : Radical Dating – Breaking Through The Barriers To Find Lasting Love After 40. I am very excited to share Nadine Litwin with you on Worldly Connektions. You never know when you go to an event where you do not know anyone what will come to pass. I first met Nadine a year ago at an Edmonton Chamber of Commerce luncheon when we sat at the same table. We chatted and I learned that Nadine helped people with insurance and investments. We recently reconnected and she is now also helping people find a variety of unclaimed property, assets, money and insurance that has been unclaimed by people. Maybe your Grandfather had a paid up insurance policy that no one knew about, a bank account that was forgotten. Listen to my conversation with Nadine and learn more. I found the topic very interesting. You can also find Nadine at www.imonies.ca, or email her at nlitwin@imonies.ca. A friend of mine referred me to Randy's book Lies Behind The Truth. I have to say as a fellow member of the Royal Canadian Mounted Police I was skeptical about the book. To my surprise Randy has written a book full of wisdom that took me on a delightful journey full of wisdom. This book is a great read and will make a great gift. Shirley and I had an interesting telephone conversation about abundance and I asked her to come on the show so that we could share with all of you how abundance has shown up in our life. Abundance comes in all ways from all sources, the law of attraction is always at work. Enjoy. To connect with Shirley you can find her at Shirley Lumme on facebook. I met Chelsey Love when she moved into an apartment we were renting. I loved her energy and her passion for helping others. She came to Edmonton from PEI to study and become a Registered Dietitian/Nutritionist and now practices in Calgary, Alberta for the past 6 years. She shares her wisdom about how to eat healthy during the various holidays throughout the year. Have you heard of Feng Shui? My guest today is Anita Adrian and she is a Feng Shui expert. She shares with us how clutter affects our own energy and how the placement of furniture can literally change our lives. It can bring in more wealth, health and create happier lives. I met Alice when we took a workshop together with Caterina Rando in San Francisco. She shared with me a play she had written called Okinawa, 1945. Many like me have no idea about WW II except what we were taught in school history class. I loved the play about a piece of history few people know about, Okinawa, Japan and the comfort women. Vikki MacKinnon is one of North America's most respected numerologists and is known to be deeply spiritual and insightful yet refreshingly practical and down-to-earth. She is the founder and creator of Born To Thrive Weekend, which she holds in Canada and Tokyo, and the author of Please Take A Number. I have had the benefit of Vikki doing my personal numbers as well as my business. Check out the interview and learn what your numbers could say about you. I love the Internet! That is how I met Byron Morrison the author of Become a Better You, Stop dieting. Start Living. It is a great book and what I liked the most about it is how he ranked his four "Pillars" with diet and nutrition last. Like Byron I believe the first 3 are important components that need to be addressed before good diet and nutrition can be sustained. Listen as Byron shares why this books contents are so important to him. Alex and Kameron Ruiz stumped me when I met them at Jack Canfield's One Day To Greatness Event. I was on Jack's assist team and while we were waiting for the doors to open after lunch I started to chat with them and their 13 year old son. Little did I know then they would peek my curiosity about CryptoCurrency. Time was limited so I had to have Alex on the show to have him explain what CryptoCurrency was and how Alex an his wife Kameron came to be known as the CryptoCurrency Couple. My first introduction to Lorna was through a shared Facebook message that a friend of mine in the United States tagged me in. It was a news clip of Lorna doing a photo shoot for her, what has become known as, "Lorna's Scars Project". I wanted to learn more. I sent a Facebook message to Lorna asking her to connect and gave her my phone number. Lorna called me within 5 minutes and the rest is history. Listen as she shares her journey and her vision of future projects. Kathy Sparrow is a self-leadership expert, message strategist, award-winning author, speaker, and university professor. With stewardship of people at the core of her message and mission, Kathy is driven by her passion to assist individuals to discover their authentic presence, embrace change with a sense of adventure, and express themselves in all areas of life with confidence, awareness, and courage, using the tools of writing, fly fishing, and intentional conversation. She is the co-author of Ignite Your Leadership: Proven Tools for Leaders to Energize Teams, Fuel Momentum, and Accelerate Results (Motivational Press February 2017). In Her chapter “The Power of Your Story: Discovering Your Why, Dissolving Your Why Nots,” discusses that when leader knows their “why” they have the personal power and confidence to do great things in the world and are able to influence those around them to be more engaged and productive at work. And when the “why nots” are addressed––we can remedy the imbalances created when we’re seeking the approval of those around us––which many of us do––and ultimately hide the true gifts we posses that we can share with the world. Representing the global face of leadership, she is joined by ten international leadership experts who met at Jack Canfield’s advanced trainings. Other authors are: Neel Raman, Pete Winiarski, Nathalie Osborn, Sergio Sedas, Jane Ransom, Jaroslav Průša, Sally Dooley, Amina Makhdoom, Connie Whitesell, and Lynden Kidd. -What inspired Perdita to create "Write to Empowerment"? -How has this business impacted her life? -What's next for Write to Empowerment? Perdita is a mom of two boys, partner, realtor and now "creator." She is always seeking and finally finding, a natural born cheerleader. She also loves photography, wine, and words (not always in that order)!